Here is a guitar/vocal play-through performed by Dallas Toler-Wade. The song is called Anthem for the Mentally Scarred, and is the first track on Narcotic Wasteland's debut album which was released in 2014. New updates are coming soon. Hamartia' available now via The End Records! Dreaming Dead- Fall tour dates announcing soon! Taken from "Funeral Twilight" from Dreaming Dead, out NOW on CD/Digital at Hammerheart Records! Considering that the AVI is off the strip and both Cheap Trick and separately Willie Nelson were playing at casinos on the strip 20 minutes away. Quiet Riot still manages to bang 800 -900 heads! NARCOTIC WASTELAND, the now full-time project of former Nile frontman Dallas Toler-Wade, is set to release new music soon. To satisfy fans in the meantime, the band has re-issued their 2014 self-titled debut album, Narcotic Wasteland, out today via Megaforce Records/MRI. NARCOTIC WASTELAND - the extreme death metal project which originally started out as a side venture of Dallas' that he focused on while not writing/performing with Nile - has now taken hold of his full focus after his departure from the band. Dallas states: "I left Nile for many other reasons that will remain undisclosed, not just for the reasons they detailed in their statement, which were "to focus on my own plans and recordings". That quote didn't come from me. I was already putting a lot of my time and energy into NARCOTIC WASTELAND when Nile was not busy writing or touring. My intention was to do shows and albums with NARCOTIC WASTELAND on the flipside, because I like to stay busy. I will continue to write and perform music on whatever level I can for as long as I can. From now on, NARCOTIC WASTELAND will be my main musical focus." NARCOTIC WASTELAND's underlying concept is reflective of its namesake and the city where Dallas, Edwin, and Chris grew up. Fayetteville, North Carolina, a military town, has a PTSD rate of up to 75% in males and is the highest rated city in the US for Shaken Baby Syndrome. The availability of street drugs is astounding and the ever growing epidemic of addiction to pharmaceutical drugs is an extremely toxic and unstable environment to grow up and live in. Dallas adds: "Other than join the military, for us, there was nothing to do but work low paying jobs and do drugs. Nothing to do but get in trouble, but music saved us from the otherwise depressing round of existence, as there wasn't much of a positive outlet there other than music for Edwin, Chris, and I. Although hard drugs and death are sort of a main topic, it's not the only topic. We, as a band, do not want too many limitations on what we write about. On Narcotic Wasteland,there is a song about South Carolina's most famous serial killer (Donald Henry Gaskins), and another song with an anti-organized religion message. Like I have said many times over the years, Iron Maiden doesn't only write songs about iron maidens!" Dallas briefly hints at details regarding the band's upcoming album, scheduled to release later this year: "We are in the process of finishing up our second album right now, and the topic of drug use and death is still present, but we are also branching off a bit to talk about venomous human behavior, self-reflection, and big pharmaceutical companies ruining lives for big profits. NARCOTIC WASTELAND's new music will retain its already established sound while expanding into more dark, sinister, and melancholy-sounding passages, capturing the mental imagery of the lyrics. The band's mission is to write challenging music without losing a sense of meaning, connecting to the listener as emotionally as possible and providing a release for their anger and sadness. Dallas adds: "The musical journey for me is and has always been to improve and connect to the listener. NARCOTIC WASTELAND is very excited to work with Megaforce Records, Adrenaline PR and Ashley Talent International, LLC on the upcoming record. We plan to bring our music to as many people and places we can in the upcoming years." Stay tuned for more details coming soon on new NARCOTIC WASTELAND music and touring. Rock Legions Cruise VI has been announced! Blackfoot's "Need My Ride" video premier is exclusive at or click picture below. Drummer Frankie Banali confirms vocalist Seann Nicols is out after short stint. Click picture for more details. SWEET (The Sweet) have the NUMBER 1 SONG, "FOX ON THE RUN" from the new hit movie"GUARDIANS OF THE GALAXY Part 2" on the iTUNES ROCK Chart. We are happy to inform you that our clients SWEET (The Sweet) have the NUMBER 1 SONG, "FOX ON THE RUN" from the new hit movie"GUARDIANS OF THE GALAXY Part 2" on the iTUNES ROCK Chart. Additionally they have also achieved the position of NUMBER 66 on the Top 100 iTUNES Songs Chart. This achievement comes immediately after the bands smash hit "BALLROOM BLITZ" has been, and continues to be, showcased worldwide as the international trailer in the smash hit motion picture "SUICIDE SQUAD." WE ARE NOW BOOKING THEIR PERSONAL APPEARANCES FOR 2017 THROUGHOUT NORTH AMERICA. PLEASE CALL OR EMAIL FOR AVAILS, BOOKING AND MORE INFORMATION. Quiet Riot Announces New Record 2017! QUIET RIOT’s new studio album, "Road Rage", will be released on April 21st. Famously known as the first Heavy Metal band to top the Pop charts, the Los Angeles quartet became a global sensation thanks to their monstrous smash hit 1983 album, "Metal Health". The band now continues their historic journey in 2017 with drummer Frankie Banali, bassist Chuck Wright, guitarist Alex Grossi, and vocalist Seann Nicols. "I'm very excited about the release of "Road Rage" on Frontiers Music Srl which is the first official QUIET RIOT release in eleven years. It contains all newly written and recorded original songs. We stayed true to the great tradition and sound of QUIET RIOT while at the same time always moving musically forward", says founding member Frankie Banali. Frankie Banali's history with QUIET RIOT spans over 34 years and he has the distinction of being the only member of QUIET RIOT to have recorded on every single QUIET RIOT release from 1983's "Metal Health" through 2017's "Road Rage". 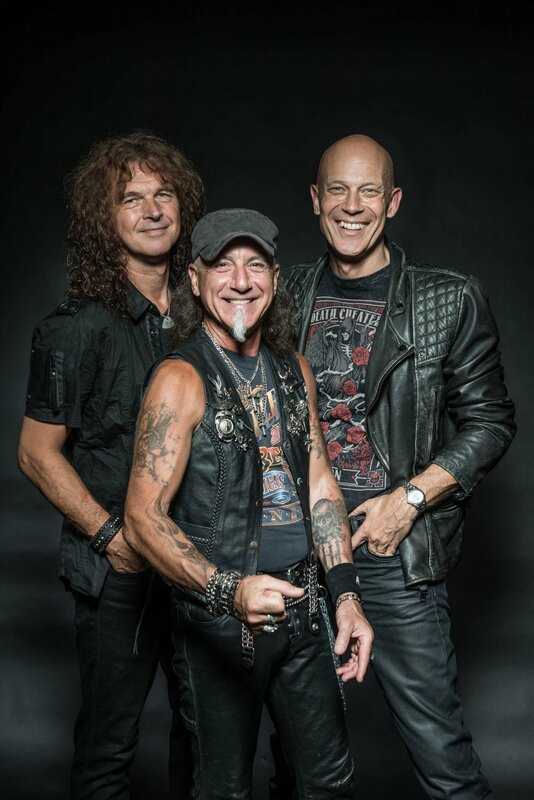 After nearly ten years since the loss of his friend and bandmate Kevin DuBrow, and with careful consideration, soul searching and with the blessings and support of Kevin DuBrow's family, Frankie has moved forward with the band to bring the fans "Road Rage". Musically, "Road Rage" offers exactly what you would expect from QUIET RIOT. Arena ready Hard Rock with strong hooks and infectious riffs, along with maturity in the songwriting that only a band with such a history and pedigree can offer. Just in case anyone has not heard the news I have departed from Nile. I would like to thank the fans of the band, all the friends and bands I met over the years. You are truly great people. This is the end of the road for me and Nile, but not the end for me and music. My band Narcotic Wasteland is going strong as we are nearing completion of our second album. We plan to release it this year and hit the road at some point. Also I did solo guitar work on Jon Vesano's new In-Defilade album slated to come out soon. I plan to stay as busy as I can with music on whatever level possible. Click on picture below for complete details. BLACKFOOT is #46 in 100% Rock’s “Top 50 Albums of 2016. Read it here.